A pizza catering service can do well in almost any city in the world. But that’s only if it is managed properly. There are some common mistakes pizza caterers and owners of pizza services commit that tend to sabotage efforts for profitability and growth. Here are 5 of the most common mistakes you should avoid when running a pizza catering service. A pizza catering service is just one example of a business that operates to feed hungry customers. You are not only competing with other pizza caterers, you are also competing against restaurants, cafeterias, food trucks, fast food joints, and food stalls. Therefore, you have to strive to beat the competition and get your name out there. Run focused marketing and advertising campaigns with your key market as the target. Use newspaper and magazine ads, online marketing techniques, strategically located posters, network extensively, and use radio adverts to win your target clients. Make the people in your area strongly aware of your superior pizzas that anytime they think of food your catering service becomes their first option. Without marketing and advertising, yours will just remain a needle in the haystack. There is a very tight balance you have to make between having unique pizzas that will get clients excited about trying them and having very unique pizzas that people will be afraid to be the first to try. We all want new things and new experiences but not too new. Additionally, you will find that many people like to stick to the familiar and will only occasionally feel adventurous enough to go for strange new foods. Keep your pizza menu simple and familiar with only a few new twists and occasional specials. In the same vein, do not sell too wide a range of accompaniments for your pizzas. Just have a reasonable selection of sauces and drinks. A very narrow choice of accompaniments will drive customers elsewhere. A very wide selection will drive you into losses as you will have so much stock expiring unsold. You have made a pizza at home several times and people seemed to like them. So why not build a business around that and offer pizza catering, right? Well, not quite. Preparing pizza for a small gathering such as a family and a few guests is a whole lot different to preparing pizza for the masses. While your family will compliment anything you make and secretly feed the disgusting parts to the cat under the table, the paying public will not be as forgiving. They will criticize you in your face, they will be very loud about it, they will write public reviews about it, and some will even blog and tweet about your tasteless, disgusting pizzas. The best way to make sure you are truly delivering high quality is to get professional training and have professionals review and critique your pizzas before you venture into business. Otherwise, be ready to make lots of refunds and fight off lots of bad publicity. It seems so easy, right? Your cousin had a birthday so you made 20 boxes of pizza and everyone had fun. They referred you to someone else who had 50 guests and you delivered delicious pizza right on time. 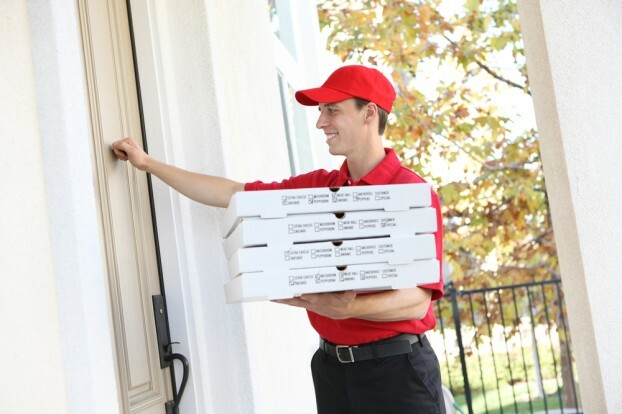 Within a few months you are distributing business cards and hiring delivery boys. But have you licensed your catering service as a business? Always work within the law or you could find yourself arrested, facing legal action, paying stupendous fines, and losing a lot of goodwill from clients, financiers, and suppliers. Starting your own business is fun and liberating, but you have to make sure you have the funds to see it through. Pizza catering is not just about having the right stove, being the best cook, and attracting customers. You have to have the money to hire caterers, delivery staff, and waiters. You need to have enough to pay for licenses, inspections, food safety certifications, event venue fees, travel expenses, and money for continual supplies even during those months when you are yet to get enough clients. Make sure you can cover your day to day expenses for even 6 months during the first few months when you will not even break even. Running a business is exhilarating and liberating. You are in charge of your own destiny. However, there are some common mistakes made especially by pizza caterers. Know these mistakes and guard yourself against committing them as they might jeopardize your business survival. Everybody loves Pizza, and so does Chris Hammond who started out as a waiter at a pizza den. He then took an interest in making pizza and has so far created about 8 of his own pizza creations that have endeared him to his customers.